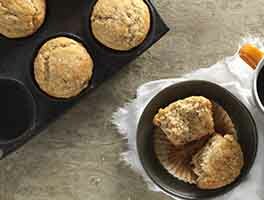 These classic blueberry muffins, made with our gluten-free baking mix, are quick and easy when you're in a hurry. Preheat the oven to 350°F. Grease 8 wells of a standard muffin pan, or line with papers. Whisk together the melted butter or oil, eggs, milk, and vanilla. Let the muffins rest for 10 minutes, then bake for 20 to 25 minutes, until a cake tester inserted into the center of a muffin comes out clean. 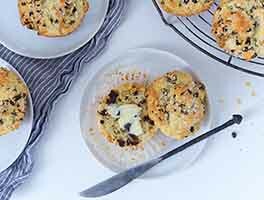 For a dairy-free version of these muffins, substitute soy milk, almond milk, or rice milk for the regular milk in the recipe. I made this, except: used 4 medium ripe bananas, pecans, pumpkin pie spice, coconut oil and coconut sugar (same measurements as it calls for sugar and oil. They came out beautiful-flavorful, fluffy, moist. I got 12 muffins out of it, putting about 3 tablespoons of batter in each. 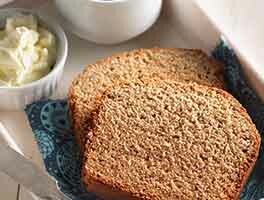 My gluten eating family loved them, and were shocked they were gf. I followed this recipe almost as is (using almond milk)... except for the blueberries. Instead of blueberries I added one mashed ripe banana, a 1/3 cup dark choc chips and a 1/3 cup chopped pecans. Fantastic!! Will make again and try other mix ins. What a huge dissappointment! I personally love the King Arthur Gluten Free Muffin Mix and have used this for years, but we just moved and the store we go to doesn't have this mix readily available. I still bought King Arthur Gluten Free Baking Flour and came to your website hoping that the recipe here would give me the same result as the box mix. Was I completely let down. I was thinking while making the muffins that it seems like a few ingredients were missing like baking powder, baking soda and salt but against my better judgment I followed this recipe to a T in hopes for the wonderful light and airy muffins I get out of your box. Well it's obvious no secrets are shared here. I can see how someone who has not baked gluten free goods might think these are wonderful but that is only because they do not know that there is better and you can have gluten free blueberry muffins that taste just as good if not better than gluten muffins. 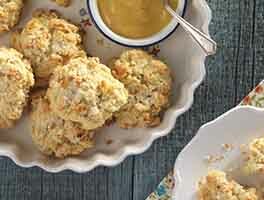 I really think you are doing a dis-service with this recipe on the site! Now if you want a dense, sweet, hockey puck blueberry muffin then enjoy! Perfect. I did, however, use coconut sugar and coconut milk to omit sugar and dairy. I got 14 muffins for this recipe, not 8. I used a gluten-free flour blend and added 1 tsp. baking powder. Delish! These turned out very good.used the recipe per instructions but I used flax eggs and only half of the sugar. Added cinnamon and used frozen wild blueberries. I baked them for 24min. In a stone muffin pan without liners..just greased with coconut oil. So fluffy and baked up with a nice muffin dome! So yummy! 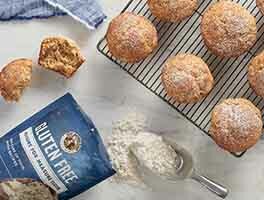 Best gluten-free muffin mix on the market! Add ANYTHING!! They're delicious every time!!! Used coconut milk for a dairy free version, and it was so delicous!!! Will definitely make again! I followed a reviewer's instruction for making 12: 2 cups of mix, 1/3 cup of avocado oil, 2 eggs, 3/4 cup of sugar a pinch of gluten free baking powder and baking soda. Instead of milk/liquid I threw a whole orange in the food processor until completely liquefied then added wet ingredients and sugar and continued to pulse until foamy. I added dry ingredients gently with a spatula and 1/2 cup of chocolate chips (kept a few to stud the top). Sprinkled sparkling sugar on top. Best muffin, gluten or not, I have ever had. 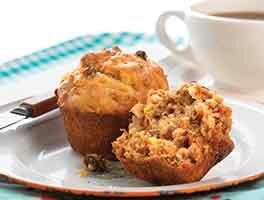 These muffins were very good and rose nicely even though I made 12 muffins from this recipe as is. Maybe I used too many blueberries. I will make this recipe again.